Normally the easel holds the paper and the artist holds the pen. For the Line Navigation Time Trial it’s the other way round. 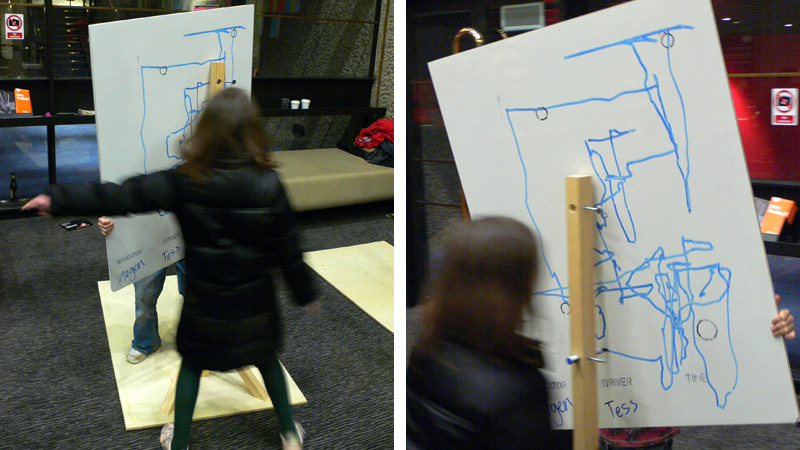 The artist holds the paper, and an easel holds the pen (fixed horizontally at waist height). For this challenge, two participants stand facing each other. One holds a board with a printed sheet on the reverse pressed up against the nib of the pen. The other gives directions as to how to move the board in order to draw a line through five circles printed on the page. The aim is for the participants to draw a line that passes through the ten circles in the shortest time possible and compete for the honour of the top position on the leader board. First conceived for the V&A Village Fête in 2007, this updated version is played on reusable wipeboards. More images & a short film can be seen here.